On August 1, 2017, Senate Bill 11, which allows licensed individuals to carry a concealed handgun on community college campuses, went into effect on the Northeast campus. 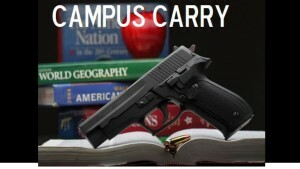 Before the implementation of the state law, NTCC administration created a committee of faculty, staff and students that worked to develop a campus carry policy. The policy states that a licensed holder carrying a concealed handgun must have the weapon holstered in a way that covers the trigger and the entire trigger guard area at all times. Carriers are responsible for knowing where or when concealed handguns are permitted, and which areas on campus are exclusion zones. Northeast Vice President of Student Services Josh Stewart was responsible for developing a policy to ensure that the appropriate signage was created and when and where it was needed in a way that corresponds with the campus policy and the state law. Students should be aware of signs posted in selected science laboratories around campus. Several of the labs have been set up as gun-free zones in order to avoid an accidental discharge that could cause dangerous effects if certain chemicals mixed with gun powder. The testing center will also be an exclusion area where a sign will be posted. There will be “temporary exclusion zones” where signs will be posted and taken down before and after certain events. These will include sporting and ceremonial events and other activities that the college president might find reasonable. Northeast President Dr. Brad Johnson said students should not be concerned about the new law because many people throughout the community are accustomed to being around firearms. Students who carry a concealed handgun must know the state law as well as the campus policy to ensure that no rules are broken in any way. If a rule is broken, students could be subject to punishment by local law enforcement.